Every day our life should be epic and not everyday. OK, I confess, I am back to writing in my blog in a effort to get more people to view my YouTube videos and subscribe to my YouTube channel. When I never did finish the blog entries for my trip to Newport. The last post was from going from Bend to Corvallis. When I got to Corvallis I found a KOA campground just outside of Corvallis. Actually as I was biking past I could smell hotdogs being cooked on campfires and looked around and found the KOA just a bit off the road. 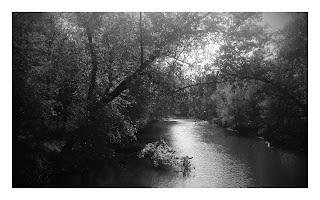 The KOA camping was a lot like the camping at the state park along the Snake River in Idaho. It just isn't the kind of camping I am use to. But I decided to have some fun with it, so I bought some of their firewood, hot dogs, roasting stick and some ketchup and joined the ranks of KOA camping. From start to finish I ended up doing a full range of accommodations. Camping in the middle of nowhere amongst the tumble weeds, one day I camped on the side of a nice road but set up my tent on a bed of goat head thorns, I stayed at the home of a total stranger, stayed at a relatives home, and even stayed in a couple of motel rooms along the way. It was different than what I was planning when I started out but I really like the way it turned out. I really enjoyed the Oregon trail historic sights along the route and riding along the Snake River was great. Then the final two days biking through the Cascades and the Coastal mountains was the perfect treat to end a great ride. Maybe it is because I was born there in Corvallis between the Cascade and Coastal mountains, but I think it is much more than that. I just love the green forests and western Oregon is just a beautiful green place. Utah has some of the best mountain biking in the world. People come from all over the world to go mountain biking in Moab, and while I do enjoy the desert mountain biking, my favorite is a nice single track through a dense forest. I love mountain biking in the mountains near my home more than in southern Utah. Western Oregon is like the local mountains, only a little lower in elevation and with a lot more green. On Strava they are doing a challenge to climb 29,028 feet in June. That is the height of Mt. Everest. The idea is to raise money to help the people of Nepal as they recover from the massive earthquakes. My heart has been aching for the people of Nepal ever since the quake. More than 8,000 people died and it left hundreds of thousands of people homeless. I really want to do something to help. So I created an account on More Than Sport and am going to try and raise $500 to http://www.morethansport.org/fundraiser/biking-for-nepal# help build shelter for the people of Nepal. So I will blog as I work towards the 29,028 feet. I made a donation for the shelters and would ask that if you can you would also help these people that need a place to protect themselves from the monsoon rains. Today was the first day of hill country. It was a lot of work getting up each hill, but the downhills were fun. I normally like to push as hard as I can down hills, but I decided to take it easy on the descents today. It was great to go over 30 mph without pedaling, but it usually ended too fast. I've missed having great downhills ever since I moved out of Utah. Some of my route went through Amish country. I saw four horses and buggies going the other direction. There were all kinds of signs for Amish furniture along the way. The great thing about the horses was that the roads had a nice wide shoulder to accommodate them. The downside was that I needed to dodge the "emissions." I biked past a small airport today. I corssed this river somewhere near Bolivar, Ohio. The picture doesn't really convey how hard these rolling hills are to climb. I made it to Washington, DC! It was great to finally arrive. I got to the capitol building at about 2 p.m. and called Tina and then called my dad. I biked a few miles around the National Mall to get some pictures. Then I took the Metro out as far as it goes and then biked out to Gaithersburg where I will be staying. The first part of my ride today was very scary. I went along a busy road that had little to no shoulder. I finally understand why Google maps was so adamant that I avoid that road. I would never bike along that road again. There was one big climb, but it didn't feel big at all after all the climbing I did on Monday and Tuesday. 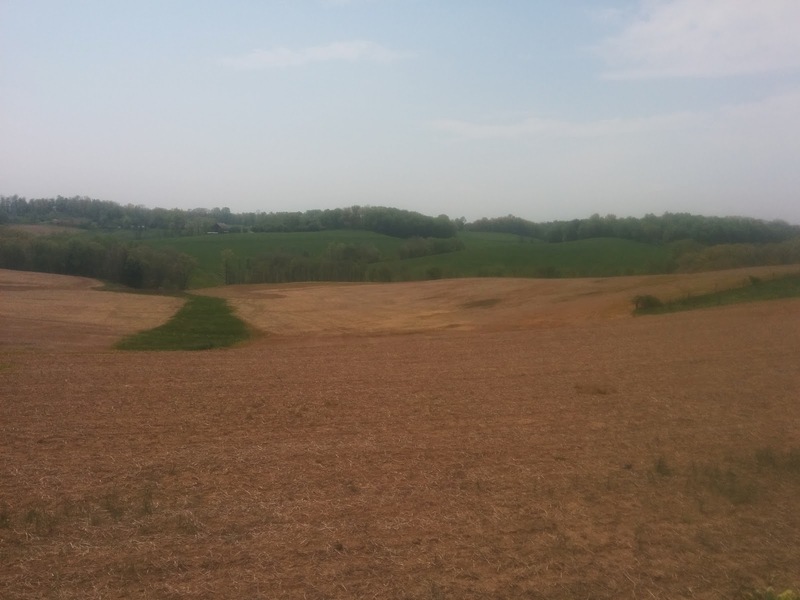 Once I reached Purcellville, Virginia, I took the Washington and Old Dominion trail to Alexandria, Virginia, and then took some other paths until I finally arrived at my destination. It was basically all downhill with a tailwind today. It was also a lot cooler than the previous days. All together it was a great day for riding. The LaMiWa Epic was a long ride, and a lot of work. Each day was challenging in different ways. The LaMiWa Epic definitely streched me beyond my comfort zone. I found that I did a lot better than I had expected. Overall, I am happy that I did it. There's a great feeling that comes with this accomplishment. I would like to thank Tina for her support. She got me a selfie stick and it helped me take some great pictures. I would also like to thank my dad for his advice and support. It was great to talk to him at the end of each day. Here are some pictures from today. Today started with about 14 miles of downhill. Eventually there were hills to climb, and I had a hard time finding the energy to climb them. It made for a difficult day. I think I didn't eat properly last night, so I was running on empty most of the way. I was glad that I didn't have to go very many miles today to make my goal. Today I made sure to eat a better dinner so that I will have the energy to make it to Washington, DC tomorrow. I nearly ran over a snake today. It was curled up on the pavement, and I came within about an inch of hitting it. There were a lot of caterpillars crawling across the road. Tomorrow there will be one final mountain pass to climb, and it will be mostly downhill to DC from there. My route will take me along an old railroad path, so there won't be any steep grades once I make it there. I took Sunday as a rest day. I did the things I normally do on Sunday. I visited the Wintersville ward for church. Then I came home and talked to family for most of the rest of the day. I think it is fun to visit other wards and meet the people in the area. It was also interesting to visit the Wintersville ward because my dad served his mission in approximately that area. I woke up "dark and early" this morning so that I could leave as soon as it was bright enough to bike. I wanted to get all the way to Frostburg, Maryland. Biking 120 miles in a day is doable, but I was more anxious about today because I knew that there would be over 10,000 feet of climbing. The section of US 40 that I followed from Washington, Pennsylvania to Frostburg, Maryland is sometimes called the "roller coaster" because it goes up and down the mountains. There were some long steep climbs, and a lot of descents got me going downhill at about 40 mph with minimal effort. 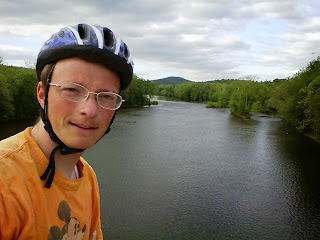 When I was in Uniontown, Pennsylvania someone tried to convince me to bike along a bike trail to get to DC. It is a gradual climb up to Frostburg in constrast to the roller coaster US 40. The thing I didn't like about his route was that it was 84 miles long while my route was 50 miles long from that point. I don't think the hills slowed me down enough to justify the extra mileage. Besides, even though I was anxious about this part of the route, this was the segment of the LaMiWa Epic that I was most looking forward to. The scenery was beautiful today. The rolling hills are stunning, and the trees are lush and green. I think my dad would have enjoyed today. It's too bad he couldn't be here. I do have to thank him, because I was unsure that I would be able to make it all the way to Frostburg until I talked to him. He thought I could make it, and that gave me the extra bit of confidence I needed to press on. 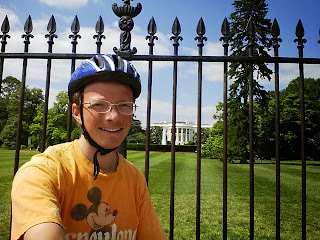 I biked in four states today: Ohio, West Virginia, Pennsylvania, and Maryland. It was fun to finally cross some state lines after spending three full days in Ohio. Tomorrow I'll bike in three states: Maryland, West Virginia, and Virginia. I'm not close enough to get to DC in one day from here, but I am close enough that the next two days will be "short" days of 70 or 80 miles. I had a nice tailwind this morning and I was able to get some good mileage until about Norwalk. I followed US 20 most of the way from Perrysburg to Norwalk, but there was a nice biking trail that went from Fremont to Bellevue that I took for some of the distance. I was getting hopeful that I might make it all the way to Strasburg. About half a mile outside of Norwalk I ran over a piece of glass and got a flat tire. I changed the tube, pulled out the glass, and pumped up the tire the best that I could. Half a mile later I got another flat. I ended up walking about 1.5 miles to a bike shop in Norwalk to see what was up. It turns out I got a "snake bite" flat. These happen when the bike goes over a big bump and the tube gets pinched. The result is two holes in ththe tube that look like a snake bite. The flat tires cost me about two hours of time. After that, I had no chance of getting to Strasburg. I was happy to make it to Wooster. I hit my first hill just a few miles outside of Ashland. When I got to Ashland, I was feeling very hot and tired. I happened to see a small shake shop on my route. It was just what I needed. 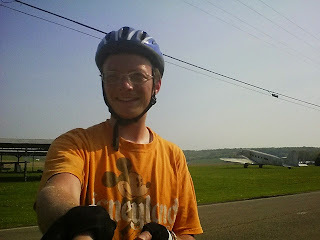 It was great to take a break and cool down before biking the rest of the way to Wooster. I've come to the end of the flat portion of my trek. I'll be climbing up some steep hills over the next few days. I probably won't be able to get as many miles in per day, but in a strange way I'm looking forward to the hills. Tomorrow's Goal: Steubenville, Ohio. It's on the border of Ohio and West Virginia. I made it to Perrysburg today. The ride has been scenic in some places as the trees are blossoming. There are lots of dandelion blossoms too. I passed a lot of houses with big lawns, and some were covered in dandelions. They look pretty while in blossom. The big thing to do around here must be mowing the lawn because I saw more people out on their lawn mowers than I could count. I thought that I crossed a state border on bike for the first time today. Then I realized that the first time I had ever done that was when I biked from Grand Junction, Colorado to Moab, Utah along the Kokopelli trail. 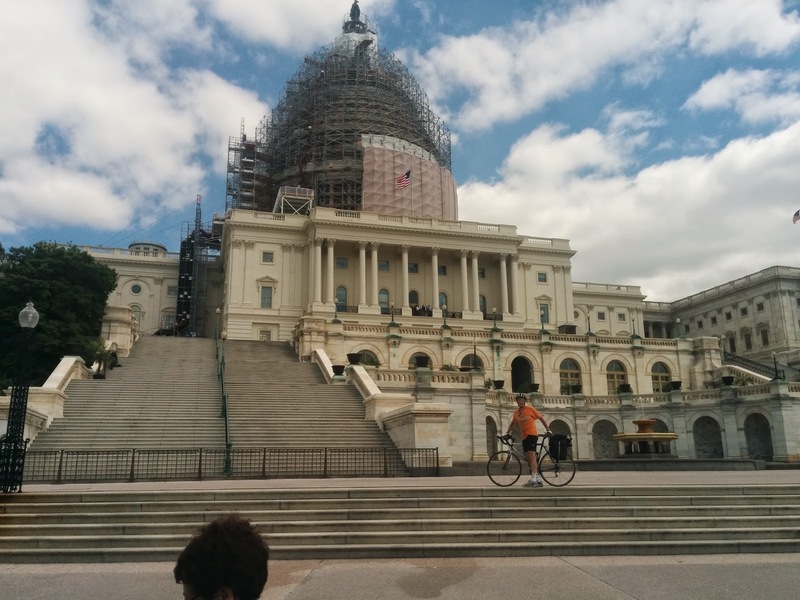 It was the first time I have ever biked from home to another state though, since I stopped by home on my way from the Michigan capitol builing to here to pick up some things I forgot. I faced a headwind most of the way today. It made for some very slow going. It was also the first time I tried riding with all my gear and I was surprised at how heavy it was. All of this made today's ride much harder than anticipated. The wind forecast looks more favorable tomorrow than it was today, so hopefully that works out. Tomorrow's Goal: Wooster, OH or Strasburg, OH if I am feeling it. Tomorrow I will embark on a bike trip from Lansing, Michigan to Washington, DC (hence the name LaMiWa). I will start at the capitol building in Lansing and finish at the capitol building in Washington. 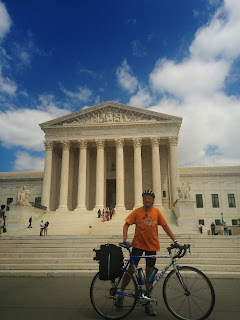 The 600 mile journey, with over 25,000 feet of climbing, will take me through six states (MI, OH, WV, PA, MD, VA) and the District of Columbia. My plan is to complete the trip in six days of pedaling plus one rest day. The first half of my route will be relatively flat through Michigan and most of Ohio. 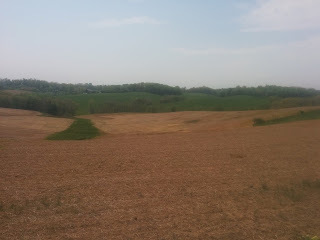 Once I reach Eastern Ohio and Western Pennsylvania, the terrain will become more rough as I climb over the Appalachians. After crossing the Appalachians, the route will still be hilly, but it will be mostly downhill until I reach DC. Why this trip? One day I was playing around on Google maps and tried looking at biking directions to various places. 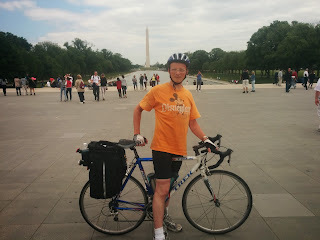 Since my wife, Tina, is from the Washington, DC area I thought I would see how long a bike trip to there would be. I thought it would be a difficult, but interesting thing to try. So my plan was that the next summer that we visited Tina's family I would leave a week early and bike out there. Then Tina can drive to Maryland, and I can put my bike on the car so I don't have to bike all the way back. Today I am finishing up all my preparations for the trip. I've been combing over the Google maps directions to make sure that the roads are bikeable. Sometimes Google maps gives biking directions with part of the route on dirt roads, but that won't work with my road bike. My dad sent me his satellite phone so I will be posting updates on my position that way. He also sent some lights for extra visibility. I also have to sort out a few things with my rain gear and bike rack. There are some packages that I hope will come today with this equipment, but I may need to find an alternative. In order to pack as lightly as possible I will be staying in motels along the way, and eating and whatever places happen to be around. I want to keep my plans flexible in case of unexpected delays. I don't need to be in DC until the 16th, so I have some breathing room in case conditions are more difficult than expected.